The Beaver Brook Trail was established in 2007 after several years of planning. SFOC member Rita Corey worked with Greg Meister of the Sharon Conservation Commission and Denny Nackoney of the Bay Circuit Trail Alliance to route and mark out the trail, which runs southward from the Sharon Train Station (eastern parking lot) for about one mile to the southwestern end of the Sharon train station. 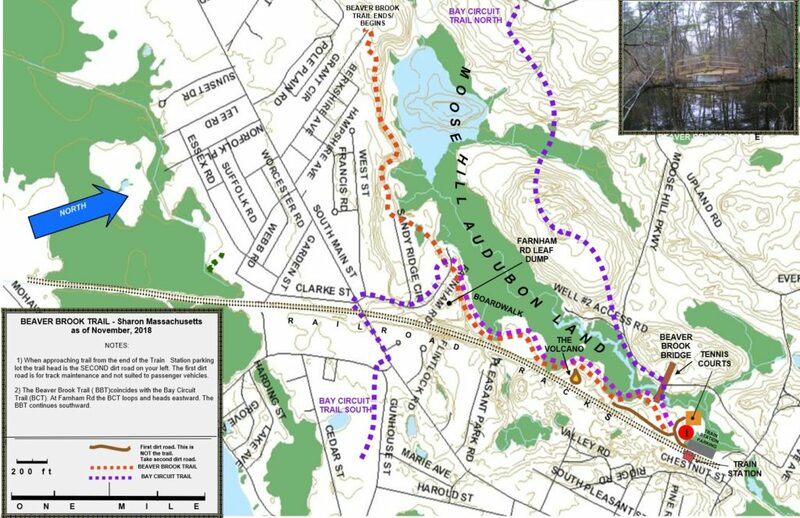 It is a convenient in-town trail and also forms an important link in the Bay Circuit Trail, a 200-mile “Emerald Necklace” walking corridor running from Ipswich to Duxbury. 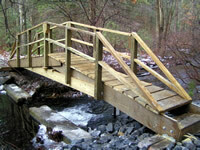 The Beaver Brook Trail was completed in 2007 by Sharon’s Boy Scout Troop 95, the Sharon Conservation Commission, and the Sharon Friends of Conservation. Its completion was capped by the installation of the Beaver Brook Bridge.The trail was extended in 2017 a by 1.8 miles to reach Berkshire Avenue. Boy Scouts Jeffrin Daniels and Scott Rubenstein re-routed sections of trail through woods which had before run along roads.